Last week Electronic Arts found out the hard way that video games' latest four letter word is actually seven letters long. News that the publisher's upcoming modern military first-person shooter was going to be set in the ongoing war in Afghanistan, based on real engagements that pitted U.S. soldiers against Taliban fighters, hit without raising much ire. But when word came out less than two months before the game's October release that the online portion of Medal of Honor, which pits players against players, would allow gamers to take on the Taliban, the reaction changed dramatically. The U.K. Defence secretary criticized the game for the inclusion of playable Taliban. So did the Canadian Defense Minster. The U.S. Navy, U.S. Army and Air Force on-base stores announced they would no longer be selling the game. The U.S. Army, which had supported the title, granting the developers access to soldiers, weapons, locations and vehicles to ensure the authenticity of Medal of Honor, were alarmed to discover the inclusion and discussed pulling their support. Last week, after spending weeks defending their decision and a month after meeting with their U.S. Army advisors, Electronic Arts did an abrupt about face and announced they were removing the playable Taliban from the game's online modes. Electronic Arts spokesman Jeff Brown said the publisher was surprised by the reaction to the inclusion of the Taliban as playable characters in the game's mulitplayer. "A year and a half ago we did sit down and discuss the ramifications of putting a game in Afghanistan, in a contemporary war," he said. "We discussed that at length and decided to go ahead. But the reaction to the multiplayer dynamic took us by surprise." The change EA eventually capitulated to seems minor, amounting to removing seven letters from the game. Not a pixel, not a frame was changed, Brown said. That minor change, however, highlights the necessity of balancing the desire to deliver an authentic experience in a movie, a book, a TV show or a video game and remaining sensitive to the people directly affected by that experience. And Medal of Honor landed squarely on that line. It's not the first game to run up against such challenges. Early last year, developers Atomic Games ran face first into a firestorm of controversy when they unveiled that their upcoming third-person shooter would be based on the Second Battle of Fallujah, or Operation Phantom Fury. 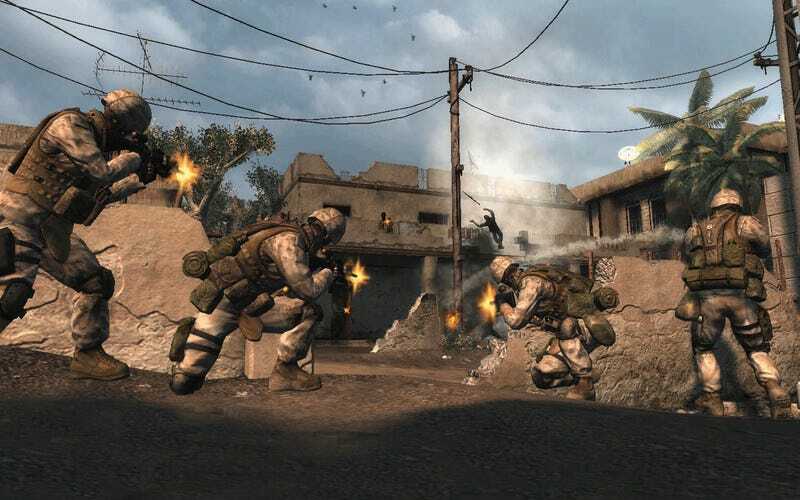 News that the developer worked with returning Marines, Iraqi civilians, war historians and enemy insurgents in creating the game ignited a furor that the game never recovered from. Just weeks after the game's unveiling, the developer confirmed that the publisher that had signed on to put Six Days in Fallujah out would no longer publish it. That doesn't mean it will never come out though. Atomic Games president Peter Tamte said it's his life purpose to make sure the game gets published. But he knows it's going to be a tough fight. "All of us who are dealing with games about real, modern wars are walking on eggshells right now, because we're probing new territory," Tamte said. "As more games about modern real wars are released, I think we'll understand more about what our medium can do well, and this will affect how future games are made." Atomic Games' decision to make a modern shooter came out of their work creating training tools for the U.S. military and intelligence communities, Tamte said. "Six Days in Fallujah was begun when Marines who participated in the battle suggested we create a game about their experiences," he said. Ultimately that was also the problem the game ran into. "We originally focused all of our efforts on the Marines who fought in Fallujah," he said. "In hindsight, it was a terrible oversight for us not to involve the families of fallen Marines in the earlier stages. We're trying to make up for this now." It was the families of fallen soldiers who provoked developer Danger Close's decision to pull the playable Taliban from Medal of Honor. But the change, framed as one that simply switches out the word Taliban with the word OPFOR, for Opposing Force, feels as if it falls in some unsatisfying middle ground - neither a meaningful change for the aggrieved nor a stance for gamers seeking authenticity, backed by freedom of speech. Why downplay the change with a nod and a wink to gamers, as Brown did by later saying that the game takes place in Afghanistan so "it's pretty clear who is fighting who"? Perhaps it is because, as Tamte points out, this is all new territory. Speaking with the folks at the U.S. Army who worked with Danger Close on the title, it's clear that the developers had nothing but the best intentions at heart. No one I spoke to thinks that the developer deliberately kept news of the playable Taliban from the Army. Perhaps this is the only way video games as a medium can push forward its ability to tackle sensitive and important subjects; with baby steps. Where Six Days in Fallujah failed to get published, Medal of Honor just has to cut the ability to place players in the shoes of enemies our country is currently at war with. Perhaps that will come next, after Medal of Honor proves itself. If Medal of Honor proves itself. Retired Lt. Col. Greg Bishop, who in his military job oversaw the Army's work with the developers, puts it best. "It is a delicate subject because we are still in the conflict," he said. "It is really one of those things that you can't predict until you lay it out there."